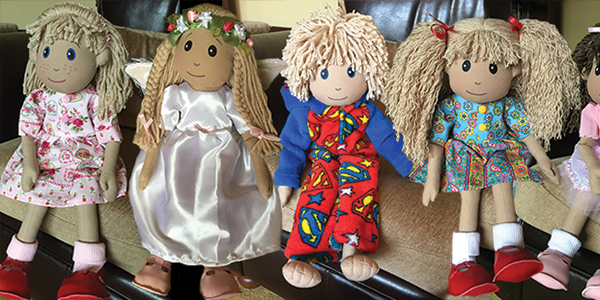 Find out what's happening at SewChildlike on Facebook. Hi, my name is Gillian, I live in Lancashire with my husband, two sons and several animals! I have enjoyed crafts, as a hobby, all my life, and worked as a graphic designer for over ten years. I'll try anything arty and once won a car for designing a window display! My art supplies are gradually taking over the house and this is fuelled by my addiction for buying lovely fabric. I made my first doll from a purchased pattern and decided straight away to design my very own doll body pattern which would be totally unique to myself. As well as using fabric to make summer dresses for myself, I now have an excuse to buy even more fabric to dress my dolls - a win, win situation!! SewChildlike doll bodies (18" approx) are usually made from my tea-dyed cotton. 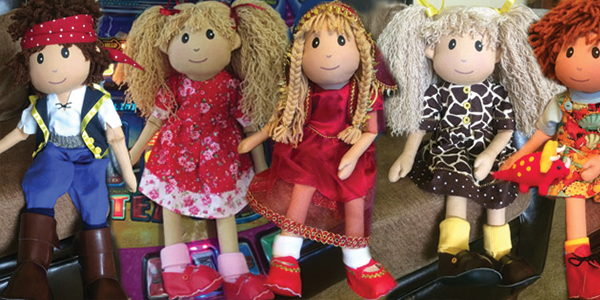 My dolls are made from thirteen different fabric pieces, stuffed firmly and slightly weighted with rice. They have painted faces and handsewn woollen hair. Once I've dressed them, they usually have little details such as buttons, poppers, trims etc. 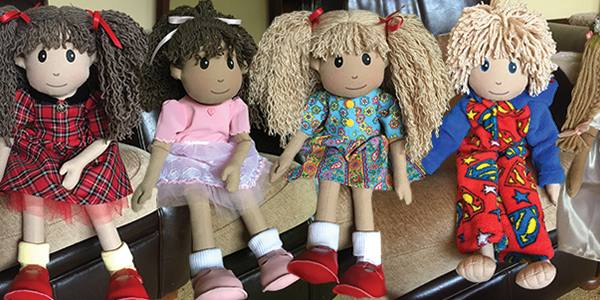 My dolls DO NOT carry the CE mark - they are individuals. 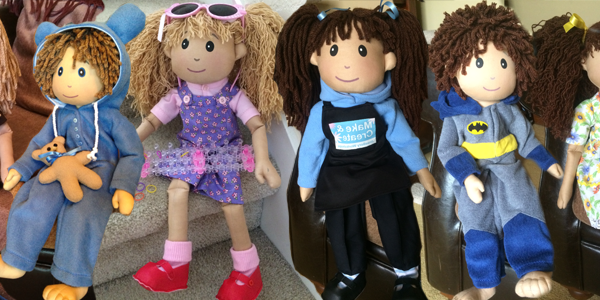 Anyone who has seen or bought one of my dolls will be able to appreciate the amount of work and time that goes into making each and every single one. My dolls are not just ornaments to be positioned on a shelf, they are tough little cookies and will withstand much handling. 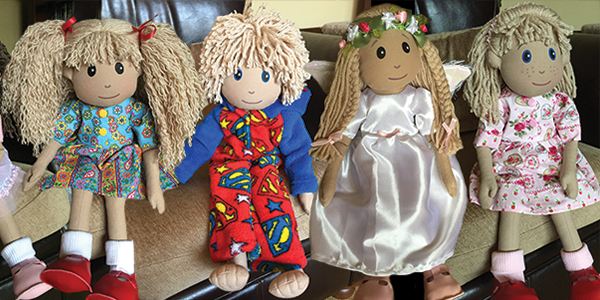 If you would like more details about my dolls, the best and quickest way to contact me is via Facebook Private Message but you can also send me an email. 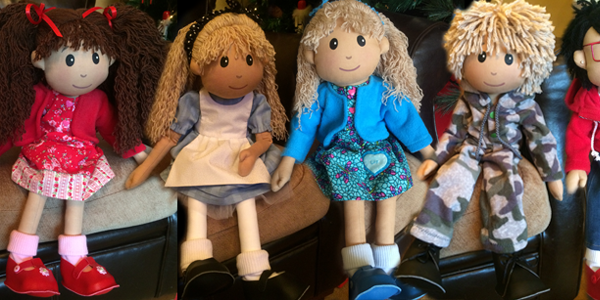 Check out my doll Gallery to see some of the dolls I've already made. If you have an idea what you'd like (maybe you're matching your child's hair and their favourite colour), just contact me and I can give you a quote. Should you decide to go ahead and place an order, I would first make the doll, send you a photo and if you are happy, I would invoice you at this stage (preferably via PayPal - you don't need to have a PayPal account). I use a trackable courier for deliveries. Besides chocolate! . . . Well, lots of stuff really but it would be great, one day, to unexpectedly come across one of my dolls whilst out and about in the big wide world!